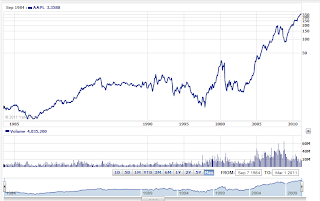 Since Apple unveiled the latest iPAd the stock went up within a few hours 1.38% up to over $352 a piece. The day is not over and it might go up much further. Not only because the iPad 2 is a great new version of the iPad and went again ahead of the competition like the Motorola Xoom. It is as well because the shareholders and everybody saw Steve presenting the keynote which gives more security to the investors. Everybody seem to see the success directly attached to Steve. Which is true but we should not forget that Jonathan Ive might leave Apple if the rumors are correct (he wants to be back in London with family). There are many people people behind Apple but of course Steve is the Flagship. 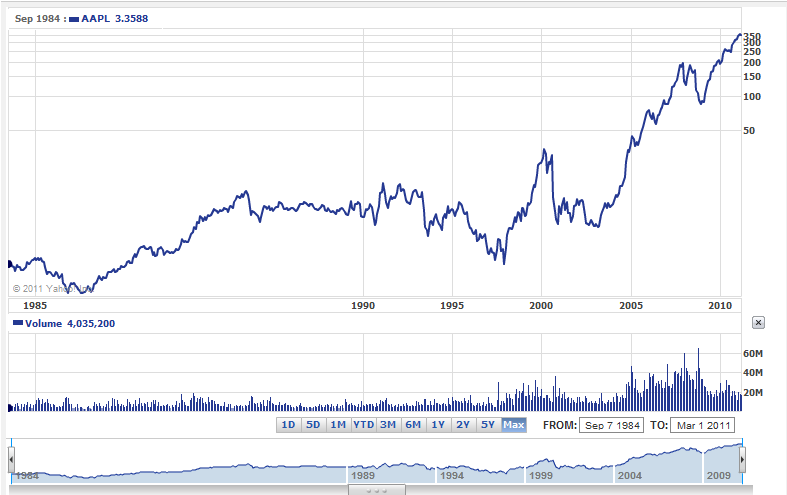 Imagine you might have bought Apple stock in 1985 (which i got a present, 2 stocks). Imagine you bought 5000 stocks for $10,000. Then you would have today almost $2 Million in stocks. Is this not amazing?